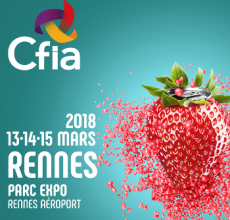 Discover our new applications of Stevial® at the CFIA in Rennes, from the 13th to the 16th of March, stand H8/D18! Firmalis proposes 2 syrups for tasting, with 50% of sugar reduction. Thanks to its original aromatic composition and to Stevia Natura's Stevial® Classic Reb A 60, Firmalis has succeeded to substitute half of the sugar content while concealing the off-notes of the Stevia. All the blind test have confirmed this feat! Come and try by yourself our syrups Mint/Kiwi and Passion-fruit/Wild rose at the stand H8/D18. 300 times sweeter than sucrose, stevia does not have a single calorie. Made from the sweetening stevia plant, Stevial® is an alternative to traditional sugar substitutes. Stevial® is a natural solution that comes from the shared vision of partners who are committed to natural answers. STEVIA NATURA, Europe’s n°1 producer of stevia extracts, MANE, the flavour and fragrance expert, LAVOLLÉE-FIRMALIS, which specialises in the distribution of high-quality ingredients, and CRISTALCO, a subsidiary of Cristal Union, the European leader in sweeteners, have joined their expertise around a shared vision of the markets of the future, decidedly more natural and transparent. With its short supply chain and secure supply, Stevial® is a unique model in Europe. Its cutting-edge technology that is certified for Quality and Food Safety enables it to produce extractions without chemical solutions. No genetically modified organisms or biotechnology processes are used in producing steviol glycosides of exceptional purity! Stevial® is used in flavoured beverages, cosmetics and pharmaceutical markets. From teas to flavoured waters, and from lip balms to toothpaste, Stevial® is an alternative to sugar and aspartame. Stevial® extracts comply with COSMOS requirements. Their cavity-fighting, sweetening properties make them appropriate for pharmaceutical use. Stevial Reb A Pharma is the only extract with a Type 4 DMF (Drug Master File). Choosing Stevial® means opting for a 100% natural solution that is in line with evolving consumer habits. Be inspired by naturalness combined with a controlled supply chain and guaranteed traceability: invest in Stevial®! Stevia Natura, french company pioneer in the extraction of Stevia and ANSM registered (No. 2016-00371 : Excipient Manufacturer), has completed the validation of its new reference STEVIAL PHARMA RebAPur in compliance with the monograph USP-FCC 9 (RebA). This is the first reference of pharma excipient/sweetener in Europe made from Stevia extract allowing its use in drugs to replace sugar or synthetic sweeteners such as Aspartame. Our factory in RIOM (France) is now certfied FSSC22000 (= ISO22000 + HACCP) by DNV-GL, international organism of certfication. This quality and food safety standard prove the reliability and quality of our operations in Europe. The Stevia Natura factory remains the only industrial unit in Europe to extract and purify the steviol glycosides, the sweet taste of the stevia rebaudiana Bertoni plant, to date. This certification is for us a quality and food safety guarantee, important for our clients confidence. Stevia Natura and Stevia Internacional Europe announce an alliance to create the european leader for the extraction of Stevia. Stevia Natura, a french company pioneer in the extraction of Stevia and in the production and sales of steviol glycosides, and Stevia Internacional Europe, with partners co-operative agro-industrial group Cristal Union with its subsidiary Cristalco, the flavor and fragrance producer V. Mane & Fils, and the specialities distributor Lavollée with its subsidiary Firmalis, are to unite strengths and skills to create the only european player capable of producing and selling steviol glycosides extracted from Stevia rebaudiana in Europe, by guaranteeing a high quality « made in France » product. Stevia Natura invests in the varietal selection of Stevia to end up plants having the best composition in steviol glycosides for a best taste while remaining 100% natural. The objective is not only to allow the culture in our latitudes with varieties more cold resistant but also to select plants with the best organoleptic result thanks to a composition in steviol glycosides the most balanced possible, and all of that 100% natural without the use of enzymes or GMO.